Please attend (and bring 3 friends!) to the Iowa City School Board meeting on Tuesday, December 10th at 6:00 pm. 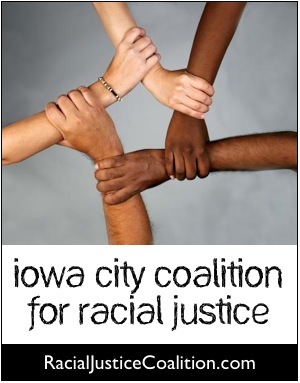 The meeting will be held at 1725 N. Dodge St. in Iowa City. The CRJ and the Center for Worker Justice are asking that the ICCSD rescind their decisions to: 1) hold school on Martin Luther King Day in January (and to return to their long-standing policy of honoring that federal holiday) and 2) require parents to show a photo ID before they can enter schools to volunteer, attend conferences or even see their own children. Both of these decisions were made without consultation with communities of color even though they will have a disproportionate impact on those communities. Come and support these important efforts toward racial and ethnic justice! Meeting: Thursday, December 12, Noon – 1:30, Center for Worker Justice, 940 S. Gilbert Ct.
We will be discussing several on-going and new racial justice initiatives focused on housing, K-12 education, and law enforcement. We will also be talking about CRJ organizational structure. Your input is important and we look forward to seeing you there! Meeting: Thursday, November 14, Noon – 1:30, Center for Worker Justice, 940 S. Gilbert Ct.
Meeting: Thursday, October 10, Noon – 1:30, First Baptist Church, 500 N. Clinton St.